Friends, Raju and Lakshmi were not able to reveal their love for each other and end up with different partners. Years later when Raju and his wife come across Lakshmi, they find that she is a widow. © 2018 Scratchu.com Letha Manasulu | Srikanth, Gopika, Kaveri, Krishna Chaitanya, Siva Parvathi, Sivaji Raja, Raghunatha Reddy, A.V.S. 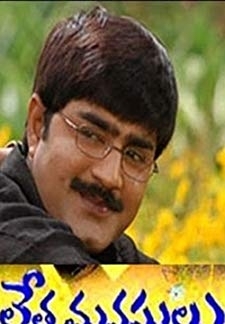 Subramanyam, Narsing Yadav - Letha Manasulu (2004) | Telugu Movie | 5.5/10 | Synopsis : Friends, Raju and Lakshmi were not able to reveal their love for each other and end up with different partners. Years later when Raju and his wife come across Lakshmi, they find that she is a widow.... Watch Online!! !